Love is a Mix Tape immediately caught my eye at the bookstore. In this age of the iPod and CDs, mix tapes seem like relics. I loved making mix tapes. There were themes: Filipino music, bands, male artists, etc. I still have boxes and boxes of them, even though I have no cassette player anymore except in the car. I lugged them halfway around the world. I loved what author/music critic Rob Sheffield said about making mix tapes, how it's almost like liberating songs from their original source. I for one, do not want to listen to a whole CD of Hootie and the Blowfish. To this day, I always put my iPod on Shuffle, liking the element of surprise: what will play next? Oh, back to the book. 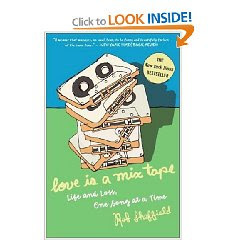 As the title says, Love is a Mix Tape: Life and Loss, One Song at a Time, this book is Mr. Sheffield's tragicomic love letter to his late wife Renee. It's not-quite High Fidelity---it's sadder, it's a true story, and it's a tribute to only one woman. But it's about music, how music brings people together, the power of music to evoke memories good or bad. As my niece says, music is life. Alternately funny and sentimental, it is an affecting book; I was moved to tears a few times. It also made me want to expand my music horizons, listen to some of the songs in Rob and Renee's playlists. And of course, it made me love music all the more.